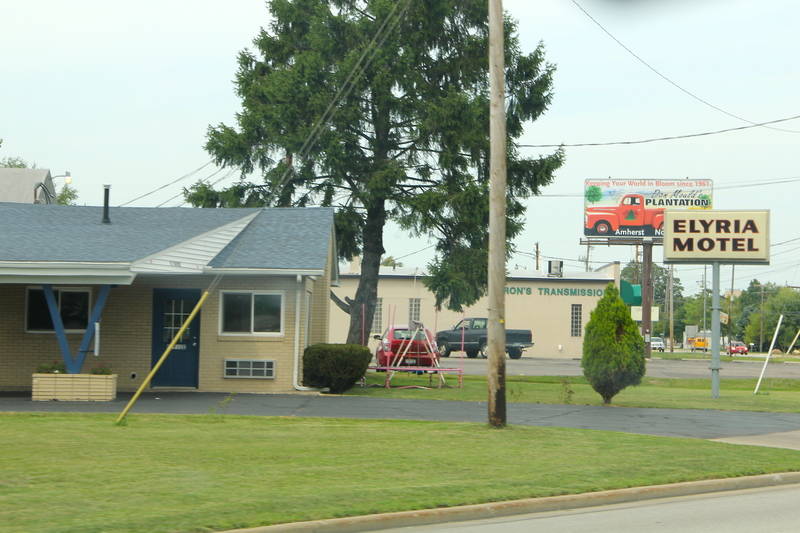 There are no hotels in the downtown areas, but along Route 20 you’ll find some classic roadside Motels, such as The Elyria Motel in Elyria, Ohio, birthplace of Sherwood Anderson, author of Winesburg, Ohio. 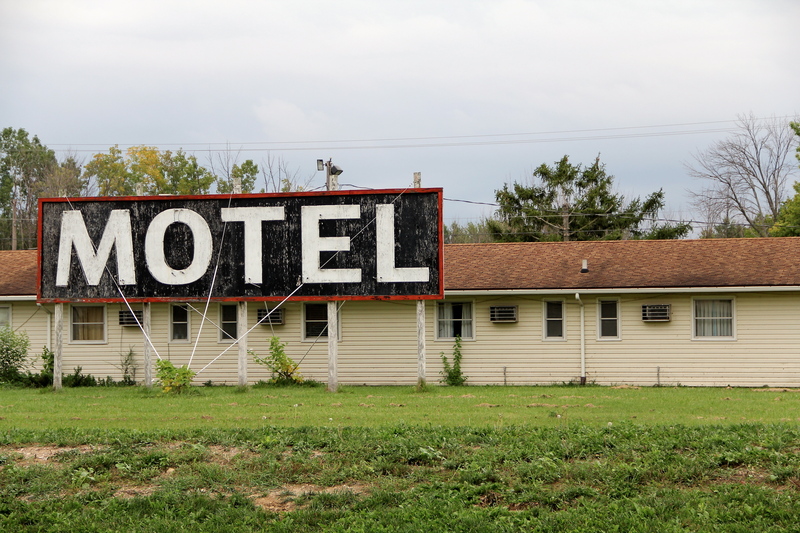 According to the local paper, The Elyria Motel is the location of an accidental suicide, so I can’t account for how cozy or clean the place is, but like many mom-and-pop motels, finding a clean well-lighted place is getting harder to do by the day, and Super 8’s are no replacement. So the road is where you find yourself in constant haze of movement, trying to get from the somewhere you just where to the where the hell are you going ahead. And every main street bleeds into the other through the veins of short-stalked browning corn—it’s too late for many of the crops in central Ohio, so ashes to ashes and dust to dirt for next year; the corporate-sponsored farms with their corporate logo signs waving to cars as they pass by will have to wait ’til next year, which is fine because now they can squeeze and extra dollar out of consumers for every four ears of corn. In Monroeville, the busiest place is the American Legion, where a couple of old timers swing open the doors to the canteen to lift a couple of haws and chain smoke as they talk about Korea, or the wives, or the jobs they don’t have anymore and all the time in the world they have to walk circles in their basement and to sip a McDonald’s coffee with the fellas at 5:30 a.m. 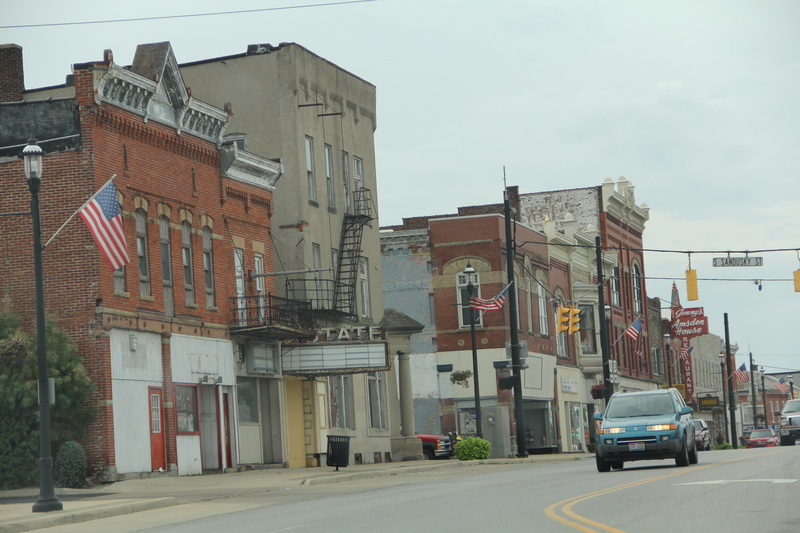 The Main Street of Bellevue, Ohio. The marquee to the theater is crestfallen in Bellevue, missing the black Helvetica letters announcing the latest picture show. Their neon tubes brittled and blown away by winds, and the tin stems of incandescent lightbulbs rotting in the nooks where electricity used to light the marquee, beckoning the couples at night or the kids with their nickels on Saturday afternoons. Nothing but the dead of night in these little towns, and the late 19th century buildings that held the commerce and livelihood of the families who lived along U.S. 20 in Ohio are shabby and do double duty as placeholders for a time that was and display windows for something going on somewhere else. Ultimately I make my last stop of the day, and before checking into the Hampton Inn in Fremont, Ohio, I have to stop in the downtown one town away and take my last look at the inspiration for the book that changed American fiction forever. The view from my window at The Hampton Inn in Fremont, Ohio. What is the best thing you have eaten so far? Your view from you window looks pretty scary. The area you are in seems like a ghost town. Has there been any places with a lot of people? My Mother’s Uncle goes to an American Legion every Sunday in Philly which is the only place he drives to. This sounds like an accurate description for the kind of people and what they would be talking about. I agree with Bianca; your view looks very unpleasant. 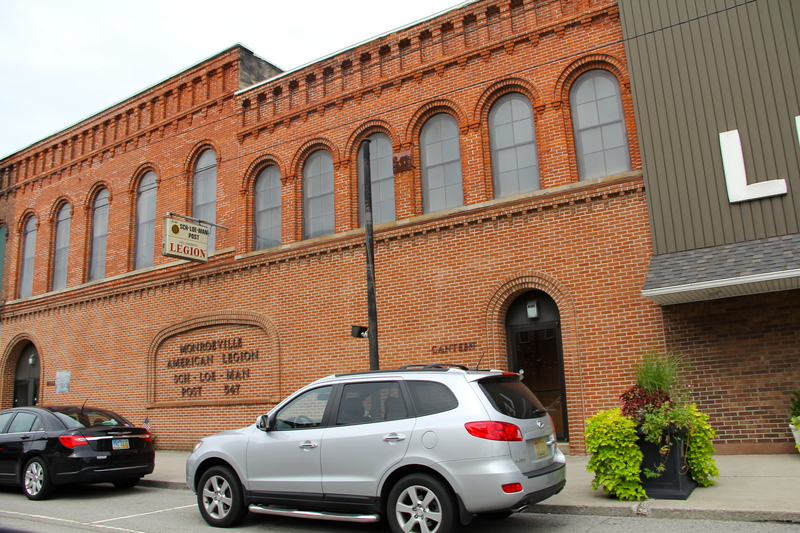 I once stayed in an inn for a night in Altoona, PA and did not enjoy it at all. Of course, Altoona is a very unpleasant place to be as well. Present day Bellevue seems very worn down and boring, but I can picture it being very lively in the past. Seems like a nice place Ohio, what’s your favorite place so far that you have been? Is it always dark and glommy out their , the pictures are very cool , what kind of camera do you use?